Successfully Added AJ-86 Stereo Bluetooth Speaker - 3.25 Inch LCD Display, Stereo Sound, Calendar, Alarm, FM Radio, Remote Control to your Shopping Cart. This portable Bluetooth speaker is a perfect accessory for your nightstand, as in addition to playing music, it can wake you up, show you the current time and date, let you listen to FM radio stations and even has a special holder for your smartphone. The AJ-86 may look slightly bigger than other Bluetooth speakers, but that actually makes it a better fit for your interior and lets the speaker double as an alarm clock and smartphone stand. Just like with other speakers, you can easily pair it to other devices via Bluetooth and play your favourite music tracks and other audio files in great stereo quality thorough the two 3W speakers. You can also pick up incoming calls and hold your phone conversations hands free, without getting out of bed. A nice addition is a mini remote control, that allows you control the playback remotely, without picking up your smartphone. 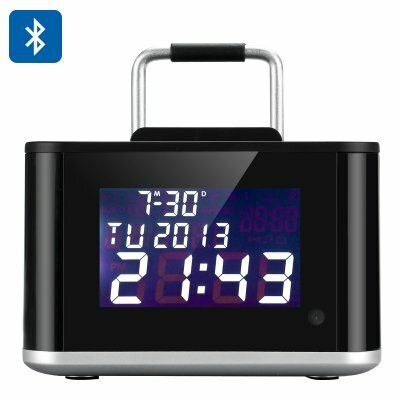 Alarm clock and calendar functions are great help in staying organized and keeping track of your day - you will see all the information clearly displayed on the 3.25 inch LCD screen. Powered by a 2000mAh battery, the speaker will give you up to 10 hours of uninterrupted playing time and will quickly recharge through a mini-USB cable. Supporting up to 32GB of external memory, the speaker can hold all your files and work independently from other devices. Thanks to a small attachment, you can conveniently place your smartphone or the mini-remote on top of the speaker, so that everything you need is right there when you wake up. The AJ-86 Bluetooth speakers comes with 12 months warranty. Brought to you by the leader in electronic devices as well as wholesale Bluetooth speakers, Chinavasion..